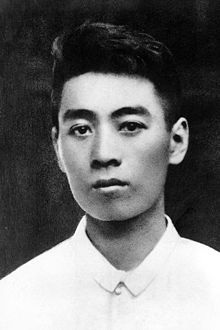 Zhou En Lai is the prime minister during Mao's reign, and is the one who ends the cultural revolution by ordering the PLA to put down the red guards. He said that in order to become a part of chinese life you needed to get your hands dirty. He was looked on very favourably, and was admired by all. He is a positive figure in the west and in Chinese history. 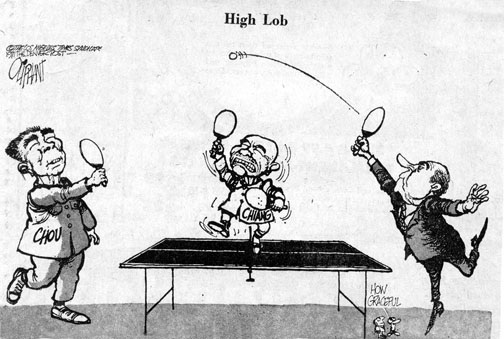 Ping pong diplomacy is when the USA recognized the republic of china (Taiwan) as the true China until the 1970's. Diplomacy began between USA and China after the US ping pong team visited in 1971 and the peoples republic took the seat on the UN security council. The US still supported Taiwans bid for independence and in 1972 Richard Nixoc visited china to begin trade negotiations. After Mao died, there was a power struggle with the gang of four and Chairman Hua took over. Question: What are some things that Zhou En-Lai did to becomes such a well liked Prime minister? Why was he so respected by everyone?